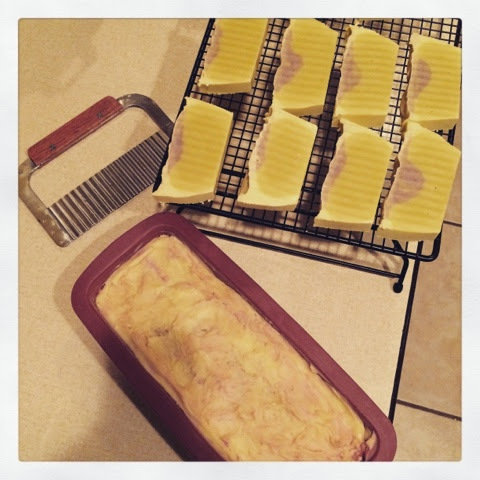 At Home with Chas: Ringing in the new year with Soap! I didn't really want to watch it, so I decided to dive into some soap recipes I had researched. 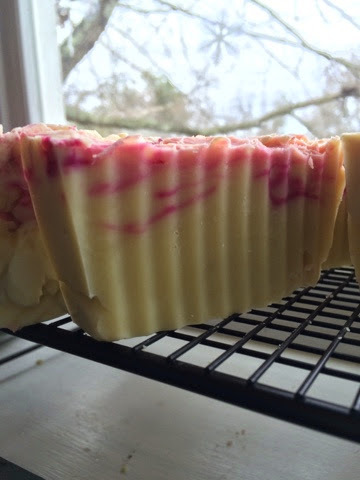 The picture above is a sweet shea butter soap with a delicious mulberry scent. I marbled a bit of red colorant in the middle and I think it turned out lovely. 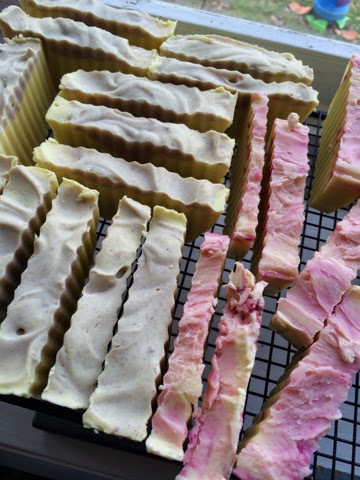 I love working in my kitchen, whether it be soap making, cooking, preserving, fermenting... there is so much that can be done. I can never imagine being bored. For that matter, I consider it a word that is off limits. If you ever are bored... give me a call, I can help you out. 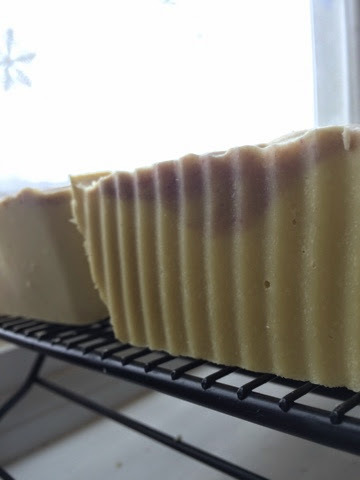 This soap is a Shea butter soap also, but it is slightly marbled with a blue colorant and it came out this pretty shade of purple. I will keep that in mind in the future and next time, I plan on adding some lavender flowers and a light lavender scent. I think that would make a beautiful soap. This one is unscented. 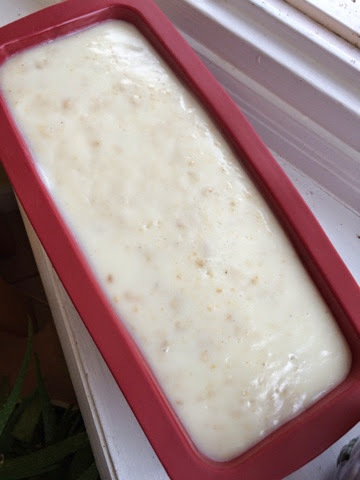 I have some family members with sensitive skin, so it will be a nice soap for them. Un-molding and cutting the soap is probably my most favorite part. I love the excitement I have when I take the soap out of the mold and see that it has set up and then once cut I can see the marbling inside. Eeek! I totally geek out on that! I just finished this soap. It's an oatmeal and honey soap. For those times when you need a bit tougher soap to cleanse. My husband works with motors and so he comes in quite mussed up. This soap will be great to have by the sink for him. The oatmeal will help to get in that deep clean! I hope you and your family have the happiest of new years and that you may be blessed abundantly! 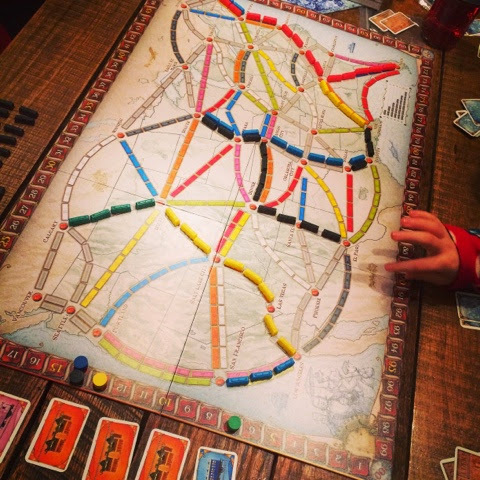 It's something I have always wanted to learn.